Children with delayed skills or skills advanced for their age level may be eligible for special services that can provide individualized instruction and programs in public schools, free of charge to your family. If you understand how to access these services, you'll be a better advocate for what your child needs. Following the passage of the Individuals with Disabilities Education Act (IDEA 97), parents of children with special needs have become even more important members of their child's education team, working with educators to develop a plan that will help their child succeed in school. This individualized education plan (IEP) describes the goals the team has set for the child for the school year, as well as any special supports that are needed to help achieve those goals. Other children who have advanced skills, either overall or in one specific area of learning such as math or reading, may need an enriched education curriculum so they don't become bored. In most cases, the services and goals outlined in an IEP can be provided in a standard school environment. This can be done in the regular classroom (for example, a reading teacher helping a small group of children who need extra assistance while the other kids in the class work on reading with the regular teacher) or in a special resource room in the regular school. The resource room can serve a group of children with similar needs who are brought together for help. However, children who need intense intervention may be taught in a special school environment. These classes have fewer students per teacher, allowing for more individualized attention. In addition, the teacher usually has specific training in helping children with special educational needs. The children spend most of their day in a special classroom and join the regular classes for nonacademic activities (like music and gym) or in academic activities in which they don't need extra help. Because the goal of IDEA 97 is to make sure that each child is educated in the least restrictive environment possible, usually every effort is made to help children stay in a regular classroom. However, when the child's needs are best met in a special class, then he or she may be placed in one. Having this information will help school personnel determine the next step. At this point, strategies that are specific to the student could be implemented for a period of time, which may help him or her become more successful in school. If this doesn't work, then the child would be tested for a specific learning disability to help determine whether the child qualifies for special services. It's important to note, though, that the presence of a disability doesn't automatically guarantee the child will receive services. For a child to be eligible, the disability must affect the child's functioning at school. 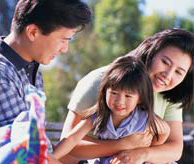 As a parent, you can decide whether to have your child assessed. If you choose to do so, you'll be asked to sign a permission form, which will describe the kinds of people involved in the process and the types of tests they use. These tests may include measures of specific school skills, such as reading or math, as well as more general developmental skills, such as speech and language. Once the team members complete their individual assessments, they develop a comprehensive evaluation report (CER) that compiles their findings and outlines the skills and support the child will need. The parents then have a chance to review the report before the IEP is developed. At the meeting, the team will discuss your child's educational needs - as described in the comprehensive evaluation report - and come up with specific, measurable short-term and annual goals for each of those needs. If you attend this meeting, you can take an active role in helping to develop the goals and determining which skills or areas will receive the most attention. The cover page of the IEP outlines the support services your child will receive and how often they will be provided (for example, occupational therapy two times per week). Support services may include special education, speech therapy, occupational or physical therapy, counseling, audiology, medical services, nursing, vision or hearing therapy, and many others. If the team recommends several services, the amount of time they take in the child's school schedule can seem overwhelming. To ease that load, some services may be provided on a consultative basis. In these cases, the professional consults with the teacher to come up with strategies to help the child but doesn't offer any hands-on instruction. For instance, an occupational therapist may suggest accommodations for a child with fine motor problems that affect his or her handwriting, and the classroom teacher would incorporate these suggestions into the handwriting lessons being taught to the entire class. Other services can be delivered right in the classroom, so the child's day isn't interrupted by therapy. For the same child who has difficulty with handwriting, an occupational therapist might work one on one with him or her while everyone else practices their handwriting skills. When deciding how and where services are offered, the child's comfort and dignity should be a top priority. The IEP will be reviewed annually to update the goals and make sure the levels of service meet your child's needs. However, IEPs can be changed at any time on an as-needed basis. If you think your child needs more, fewer, or different services, you can request a meeting and bring the team together to discuss your concerns. Specific timelines ensure that the development of an IEP moves from referral to providing services as quickly as possible. Be sure to ask about this time frame and pick up a copy of your parents' rights when your child is referred. These guidelines (sometimes called procedural safeguards) outline your rights as a parent to control what happens to your child during every step of the process. The parents' rights also describe how you can proceed if you disagree with any part of the comprehensive evaluation report or the individualized education plan - mediation and hearings are both options. You can obtain information about low-cost or free legal representation from the school district, or, if your child is in Early Intervention (for kids ages 3 to 5), you can get info through that program. Attorneys and paid advocates familiar with the IEP process will provide representation if you need it. You may also invite anyone who knows or works with your child to be a part of the IEP team if you feel his or her input would be helpful. The IEP process is complex, but it's also an effective way to develop a plan that addresses how your child learns and functions. If you have concerns, don't hesitate to ask questions about the evaluation findings or the goals recommended by the team. You know your child best and should play a central role in creating a learning plan tailored to your child's specific needs. Office of Special Education and Rehabilitative Services, U.S. Department of Education - provides information and lists programs dedicated to educating children with special needs. Wrightslaw - provides information about advocacy for children with disabilities.